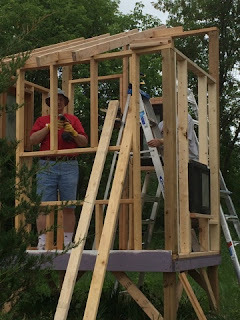 Our plans for the chicken coop were derailed...because of DH's enforced overtime. (It's just part of the job, I'm not complaining, but it's a lot of work 12 hr days!) So I ordered chicks with 6 weeks to build the coop. We started building the walls. We didn't have too much experience building buildings from scratch like this, so we had a learning curve. I learned to frame pretty well. And I can drive a nail pretty easily, assuming nobody is watching me and making me nervous. This is the first wall in the back and the second wall in the foreground. We were working on this from pictures of coops and ideas of plans so we made it up as we went along. You can see some of our other projects in the background as well. This is one of the walls that we completed. I was trying to size the window. We ended up doing something completely different when we put it up. But I tried and I got it close enough so it worked. So a few weeks go by with just the one wall built. Then the overtime started and we actually got 3 walls framed. I didn't take a picture of the third wall, but it is here when I walled it up. 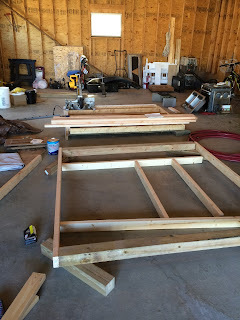 Then I put the legs on the bottom of the coop and braced them up. Moving it alone was another story all together. Above is the bottom flipped over to put the legs on it. This used to be a loft bed that a friend made for me and since it won't fit in our house we are using the pieces of it for other projects. 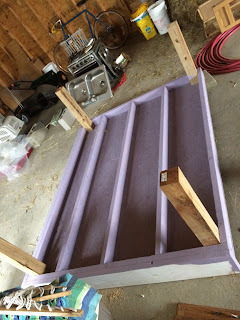 I painted the bottom with exterior paint, in the color that I want to pant the coop. So, sneak peek here. Isn't my Krunchee a cute little helper? 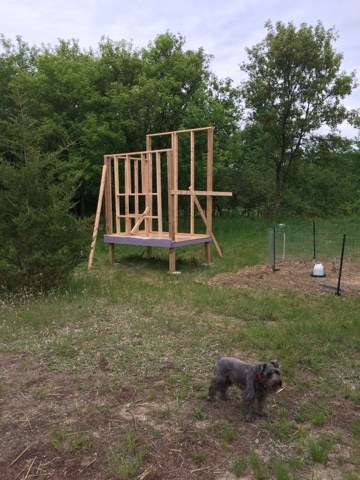 One of my awesome neighbors offered to help me carry the base outside so I could get the walls up. I was excited to get some more work done on it. He came over and helped me with that and then said, "What about those walls you have sitting here? You want to get those up too?" I didn't expect him to help me put all that up too while DH was working. I was ecstatic and we carried them out there and I nailed them down. We propped it up and nailed a board across the 2 sides, since that forth wall wasn't built yet. Then my wonderful (seriously, not sarcastic here) in-laws came to visit us. 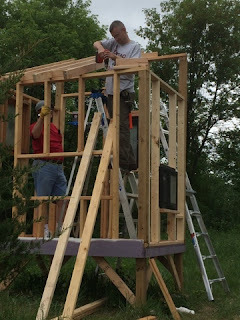 My FIN, my DH and I worked on the coop together. 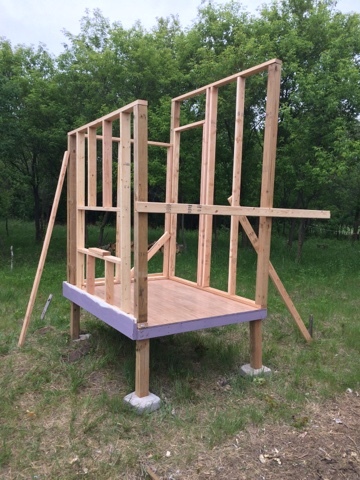 We got the forth wall made, attached to the others and the roof framed. And the best part in my opinion is that we got all the windows framed in and set up. 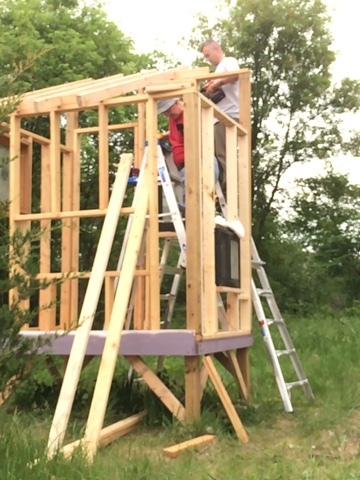 Now all that's left to do is to put the plywood on the outside and on the roof. 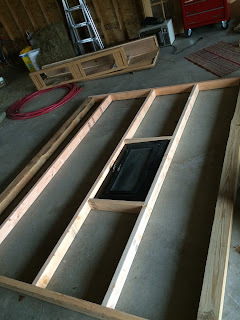 Then I need to put the roof felt and shingles on and then paint the sides. I'm thinking about adding some little touches to make it look like a house like a window box on one of the windows. These are the few pictures I could get of them working while I went to go get some more nails. Summer 2015 Project 333-First run though. Spring 2015 Project 333-final thoughts.